Domninus of Larissa was a 5th c. philosopher and member of the School of Athens. There is one treatise extant which is of certain ascription to him, a short text on arithmetic. This extant text together with some remarks in Damascius (a late antique philosopher and historian of the School of Athens, if we should indeed call him a “historian” and not a “tale-monger”) gave birth to an extraordinary picture of Domninus (going back to the eminent historian of mathematics Paul Tannery): a scientifically-minded, possibly Jewish, maverick philosopher, whose advocacy of serious science brought him into conflict with his colleagues; his sophistication was supposed to be evidenced by his extant mathematical treatises, one of which allegedly possessed distinctive Euclidean overtones. Only a few scholars had worked on Domninus before I did; almost none of them questioned Tannery’s view, which consequently made it into all lexica and handbooks. Not only the arithmetical treatise, but also two more texts were regularly adduced in the context of Domninus. It seemed necessary to edit them to clearly assess their importance, and, first and foremost, to establish if they could be used as evidence for Domninus at all. Although these editions were rewarding (as the available edition of the one text did not use all available manuscripts, and the other text was hitherto completely unedited), I was able to show that these texts do not have a connection with Domninus and should be regarded as spurious. In the case of the Encheiridion, I proved through a circumstantial analysis that the only aspect which is “Euclidian” in the whole Encheiridion is that some Nicomachean definitions are substituted with definitions found in the Elements. However, this is not the case consistently; in plan and content, the Encheiridion is much closer to Nicomachus; and at any rate, we’re talking here about definitions, not about methods; hence there is definitely no Euclidean sophistication to be found in the Encheiridion. With regards to the Damascius evidence, again, a careful analysis showed that the description of Domninus as an especially competent mathematician is nothing out of the ordinary, but a recurring description Damascius applied to philosophers he did not regard as especially competent in the more lofty philosophical disciplines. All of this leads to the final conclusion that there is no reason to assign a special position to Domninus: he is a fairly standard late antique philosopher. "In summary Dr. Dr. Riedlberger has produced a very scholarly, well-written and thoughtful treatise … This work … is now and will remain for a long time, in my opinion, the standard treatment" (Peter G. Brown, Göttinger Forum für Altertumswissenschaft). "All in all, Riedlberger has provided us with a very complete and thorough basis for dealing with Domninus. The quality of his work is in general very good and it will also be of great use to those who wish to work on the teaching of elementary arithmetic in the philosophical schools of Late Antiquity. 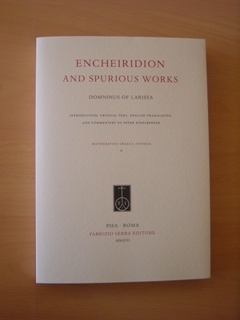 The book is beautifully produced and is a pleasure to see and to read" (Dominic O’Meara, Aestimatio). "The level of scholarship in this book is very high. … Riedlberger’s book provides a well-argued reevaluation of Domninus as a mathematician and Platonic philosopher … a valuable source for understanding the mathematical scholarship of the late-ancient period, particularly in Athens." (Nathan Sidoli, SCIAMVS). "From now onwards Riedlberger's “new Domninus” must be considered the only authoritative book on Domninus and his writing(s), as well as a reference book for the mathematical themes which Domninus (and others) dealt with." (Federico Petrucci, Bryn Mawr Classical Review). "The current available space does not allow me to expand on the numerous merits of this book. […] we are dealing with the best account on the works of Domninus we have […] the standard edition on Domninus for many years to come. […] this book is exceptionally well-written, and, thus, very pleasantly readable" (Michalis Sialaros, Journal of Hellenic Studies). "Peter Riedlberger’s great achievement with the present volume is that he has made Domninus interesting, readable and relevant to both the history of ancient mathematics, and of ancient philosophy, while at the same time not compromising on the quality of his scholarship. If only more editions of ancient scientific texts were like that." (Serafina Cuomo, Nuncius).